Jessica Trent is determined to rescue her foolish brother from debt, but to do so, she must pull him from the grasp of Sebastian Ballister, the Marquess of Dain, known by all as the worst of scoundrels. The only problem is it only takes one meeting with the Marquess of Dain for Jessica to become overwhelmed by lust for the beast. For Sebastian's part, he has no intention of being manipulated or controlled by the woman attempting to disrupt his devilish little world, but there's something about Jessica that makes her irresistible to the "Blight of the Ballisters". It's no surprise that Lord of Scoundrels is one of the most popular novels written by Loretta Chase. It's a fabulous historical romance, well paced to the point of being a completely addictive read, with quick and witty lines that had me laughing out loud. Our heroine, Jessica, is strong willed in the extreme. She always gets her way and doesn't see why the Marquess of Dane should think he can stop her. She's very loyal, even to her fool of a brother, with a strict set of morals that inevitably have her clashing with Sebastian, who is known for his less than moral behavior. Sebastian assuredly brings out Jessica's more... fiery side, despite her morals. There's even one scene when she shoots him (!!) that had me laughing in hysterics. Of course, you can imagine how this sort of fire plays out in the bedroom once everyone's put away their guns. Sebastian Ballister has a terrible reputation, and one that he is really quite proud of. He has no desire to act the part of the socially acceptable Marquess, and instead plays out the role of society's devil with dedication. Although his reputation is based completely on the truth, Sebastian's dark side comes from a troubled childhood and it is, of course, Jessica who discovers that there is more to this wicked creature than meets the eye. Not that either of them desire he be anything less than wicked in bed. Loretta Chase's writing is sublime. Her words are as wicked as her hero and I was hooked from start to finish. Really brilliant. 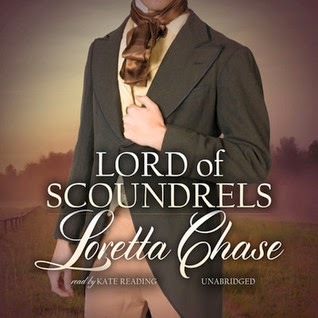 Lord of Scoundrels by Loretta Chase is read by Kate Reading, who is a first class narrator. I've listened to a few audiobooks read by Kate Reading before, so I was pleased to discover she was performing Lord of Scoundrels. She has a way of perfectly capturing each character and the tone of the narration in every book she reads, and her narration of Lord of Scoundrels is no exception. I loved every minute of it, but I particularly liked the way she captured the hero and heroine's comments of mutual disdain, even as they fell in love. It made me laugh! Lord of Scoundrels by Loretta Chase was originally published in 1995 and has now been rereleased in audiobook format by Blackstone Audio. You can find Lord of Scoundrels in multiple formats at both Amazon and Book Depository.